Originally published under the title "How the United States Mislabels Israel." The U.S. Customs and Border Protection agency now advocates sanctioning products from Israeli settlements that bear the "made in Israel" label. In a move uncharacteristic of U.S. policy as it has been carried out for decades, the Obama administration recently endorsed Europe's version of a soft Boycott, Sanctions and Divestment (BDS) campaign targeting Israeli merchandise. In late January, the U.S. Customs and Border Protection agency changed its policy on imports from the West Bank, imposing, in effect, a sanction on such goods. The penalty states that products must no longer be labeled "Made in Israel," because the United States views the West Bank as territory illegitimately controlled by Israel. Europe adopted such a labeling policy in November. Since then, the United States has chartered a zigzag course through the product demarcation debate. When asked in November if labeling constitutes a boycott, Mark C. Toner, U.S. State Department deputy spokesman, said: "It's a—it could be—it could be perceived as a step on the way." Just last month, however, Toner's boss, spokesman John Kirby, announced: "We do not view labeling the origin of products as being from the settlements a boycott of Israel. We also do not believe that labeling the origin of products is equivalent to a boycott." The United States, like the European Union, goes to great lengths to insist that demarcating Israeli products from the settlements is not a boycott. In an increasingly anti-Israel Europe, labeling could lead to sweeping damage to Israel's economy. Yet, in an increasingly anti-Israel Europe, labeling could lead to sweeping damage to Israel's economy. This slippery slope helps to explain why a bipartisan group of thirty-six senators protested the EU decision. Sens. Kirsten Gillibrand (D-NY) and Ted Cruz (R-TX) took the lead in sending a letter of objection to the EU in November. "As allies, elected representatives of the American people, and strong supporters of Israel, we urge you not to implement this labeling policy, which appears intended to discourage Europeans from purchasing these products and promote a de facto boycott of Israel. . . ," wrote the senators. To blunt European economic warfare targeting Israel, South Carolina Gov. Nikki Haley in 2015 approved legislation that outlaws public organizations from conducting business with companies that discriminate against the Jewish state. Illinois and Indiana have passed similar anti-BDS legislation. In late January, Florida legislators announced they intend to pass a bill opposing companies involved in BDS. California seeks to replicate similar pro-Israel legislation. Congressman Brendan Boyle of Pennsylvania introduced HR 2645, legislation that seeks to prohibit the federal pension system from investing in companies that boycott Israel. The combination of the U.S. State Department endorsing the EU labeling of settlement products along with intensified criticism of Israeli peace process policies gives a tailwind to the boycott supporters. The stated aims of BDS are nothing short of the dissolution of Israel and its replacement with a binational, majority Palestinian entity. Put simply, the BDS movement's goal is the opposite of peace. From the beginning of Obama's tenure, his administration has demanded that Israel halt settlement activity. These diplomatic maneuvers coming out of President Obama, Secretary of State John Kerry and the State Department at large are making Israel a partisan issue in the United States. From the beginning of Obama's time in office his administration demanded that Israel halt settlement activity. Obama's posture has been motivated by two assumptions: The key to solving the Middle East's problems rests with the Israeli-Palestinian problem, and the be-all and end-all of obstacles to a final peace agreement in the region is remedying the problem of Israel's control over the disputed territories of the West Bank, East Jerusalem and Golan Heights. This faulty "linkage theory" contributes to a growing rift between the Israeli and Palestinian positions. Both parties are aware that the settlement issue will only be solved when the final borders of Israel and a future Palestine are created, which is why Palestinian leaders Mahmoud Abbas and the late Yasser Arafat both previously entered into negotiations without a freeze on settlement construction. For that matter, if a construction freeze was so important for restarting negotiations with Israel, the PA could have initiated direct discussions during 2010's ten-month settlement moratorium rather than waiting to start talks during the month that the freeze was due to expire. Yet the White House's attitude is that it can twist Israel's arm diplomatically in exchange for security guarantees, and the slippery slope to boycotts can be used as a legitimate pressure point. The EU mirrors the U.S. escalation pressure-point strategy by seeking to compel Israel to make unilateral concessions to the Palestinians in the context of the stalled peace process. Europe insists it merely wants to inform consumers about the origin of Israeli goods. But the policy legitimizes boycott. 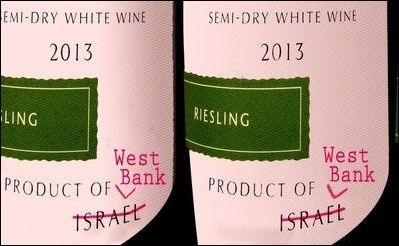 In November, the high-end Berlin department store KaDeWe removed Israeli wines from its shelves. After it was reported by the Jerusalem Post that the Nazis had stolen the store from its Jewish owners in the 1930s, KaDeWe put the wines back on its shelves. 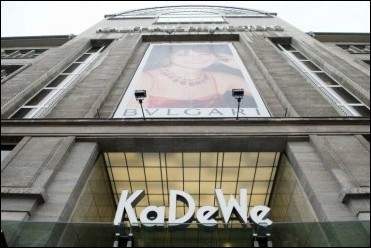 The Berlin department store KaDeWe pulled Israeli wines from its shelves in November, then reversed the decision after the Jerusalem Post reported that the Nazis had seized the store from its Jewish owners in the 1930s. Anti-Israel animus in Europe has fostered conditions that legitimate a path to a form of anti-Semitism that one recalls from the turbulent 1930s. The Nazi party launched a "Don't Buy from Jews!" movement in Germany. Substitute "Don't Buy from Israel," and one grasps the moral perils of economic warfare. The European BDS movement has some unsavory optics attached to it. In 2012, the neo-Nazi National Democratic Party of Germany (NPD) submitted a legislative initiative in the state parliament of Mecklenburg-Western Pomerania to mark Israeli products. The NPD in the state of Thuringia praised the Social Democratic Party mayor of Jena, Albrecht Schröter, for signing a petition seeking mandatory labeling of Israeli products. In 2013, Germany's powerful Green Party introduced an initiative in the Bundestag that largely mirrored the neo-Nazi-sponsored legislation from 2012. Green Party MPs belabor the talking point that labeling is intended to raise "consumer awareness." By way of background, in 1983, the Greens put out a "Green Calendar" with the headline "Israel, the gang of murderers" and called for a "boycott of goods from Israel." The EU naively believes that the root cause of the Israeli-Palestinian conflict lies in the "occupation," and the way to a solution is economic pressure targeting Israel. After all, the EU has singled out Israel while finding no need, for example, to label Turkish products from the illicitly occupied North Cyprus. The EU also refuses to penalize Morocco for its illegal seizure of Western Sahara. In an interesting twist, the most left-wing government in Greece's history announced its opposition to implementing the EU's Israel-product label policy. Hungary joined Greece in opposing the labeling measure. The Czech parliament also rejected it. Anti-Israel boycotts deflect attention from the real obstacles to peace, and from real opportunities to achieve it. Boycotts don't bring peace any closer, especially not in the Middle East. Instead, they deflect attention from the real obstacles to peace and the real opportunities that exist, many of which are provided precisely by the academia that the anti-Israel crowd targets. The labeling measure, unfortunately, provides a shot in the arm for academic boycotts. British and Italian academics have recently called for a boycott of Israeli scholarly institutions. A new Human Rights Watch report has called for a boycott of Israeli companies in the disputed territories, which employ nearly 21,000 Palestinians. HRW infamously sought to raise funds in Saudi Arabia to bash Israel. Its obsessive focus on targeting Israel with economic warfare instead of on the non-free countries in the Middle East is well documentated. In one example of how economic pressure backfires, the Israeli company SodaStream was forced to close its West Bank operation because of BDS. The closure entailed the loss of nearly one thousand well-paying jobs for Palestinians. SodaStream—one of the first companies to be targeted by the boycott movement—offered Syrian refugees jobs. This year, Congress passed Trade Promotion Authority (TPA) legislation requiring the United States to "discourage Europe from enacting any politically motivated policies that would boycott, divest from, or sanction Israel when negotiating the Transatlantic Trade and Investment Partnership." What can be done to stymie the BDS movement? Given the growing European hostility toward Israel, it is long overdue that an ironclad anti-BDS provision be made part of the free trade deal. Secondary sanctions and other financial penalties hitting recalcitrant pro-BDS EU companies and countries would quickly influence a change in European behavior.